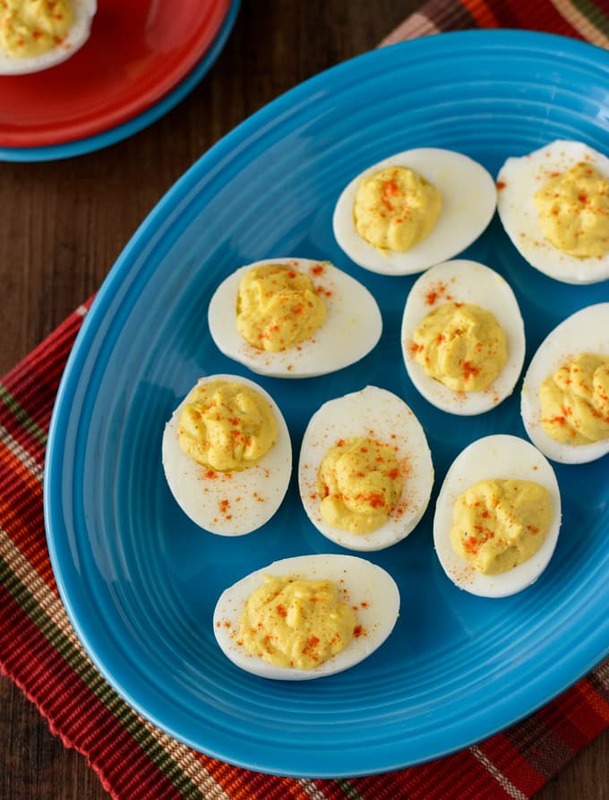 This Best Deviled Eggs recipe is a must-have finger food for every party. The creamy and tangy filling make these a real crowd pleaser. Super easy to make and delicious! 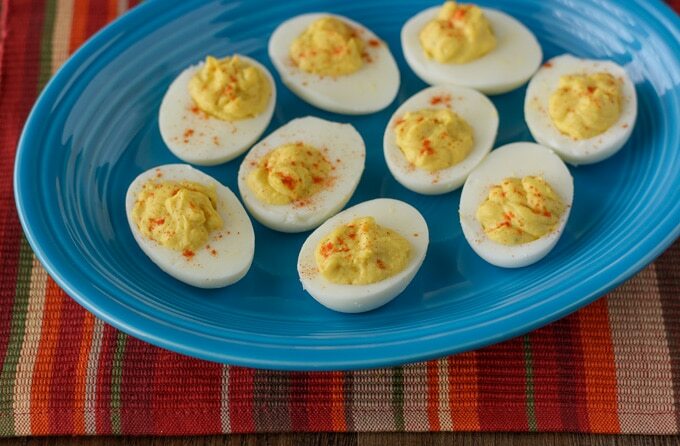 Growing up, my mom had THE best deviled eggs recipe that I’ve ever tried. It’s been quite some time since she’s made them, and I really had a craving for them recently. I’d asked her for her recipe years ago, and she didn’t have one. Like many cooks of her generation, she just “knew” the amounts of ingredients she used. So, yeah, not really all that helpful. Ha! After looking at a few other deviled eggs recipes, I had a basic idea of what I needed. Although there are many variations out there, the Best Deviled Eggs recipe only requires a handful of ingredients. Mayo, mustard, vinegar, salt, and pepper. That’s it. I started with mayo and added mustard and vinegar until I had something that tasted like my mom’s version. Just the right amount of tanginess and super creamy. Finally, I have another recipe that takes me back to my childhood. Slice the hardboiled eggs in half lengthwise. Carefully remove the yolks and place into a bowl. Mash the yolks as fine as you can with a fork. Add the mayo, mustard, vinegar, salt, and pepper and mix until well combined and creamy. Arrange the whites on a serving platter. Using either two spoons or a pastry bag filled with the mixture and fitted with a decorative tip, evenly distribute the mixture into the egg whites. If desired, sprinkle a bit of paprika onto each egg. Let chill for at least an hour before serving. Although best eaten within 24 hours, they will last between 3-4 days tightly covered in the refrigerator. If making a day ahead, wait until just before serving to add the paprika. *If you have a fool-proof method of making hard boiled eggs, by all means, use that one. And do share in the comments below. I loosely follow Martha Stewart’s method for Perfect Hard Boiled Eggs, which is one of the best I’ve found. 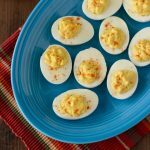 Featuring a tangy and creamy filling, these Deviled Eggs make the perfect finger food to serve at parties. Place eggs in a 2-qt saucepan. Add enough cold water to cover by an inch. Over medium-high heat, bring to a boil. Once at a rolling boil, remove from heat, cover and let sit for 12 minutes. Strain the water from the saucepan and run cold water over the eggs to cool them. Let the water run over them for a minute or two. Shake the pan from side to side until there are multiple cracks in each egg. Then carefully peel each egg. Slice the hardboiled eggs in half lengthwise. Carefully remove the yolks and place into a bowl. Mash the yolks as fine as you can with a fork. Add the mayo, mustard, vinegar, salt, and pepper and mix until well combined and creamy. Arrange the whites on a serving platter. Using either two spoons or a pastry bag filled with the mixture and fitted with a decorative tip, evenly distribute the mixture into the egg whites. If desired, sprinkle a bit of paprika onto each egg. Let chill for at least an hour before serving. If you have trouble peeling the eggs, you might try peeling them under running water. By Tempie at March 31, 2018 .